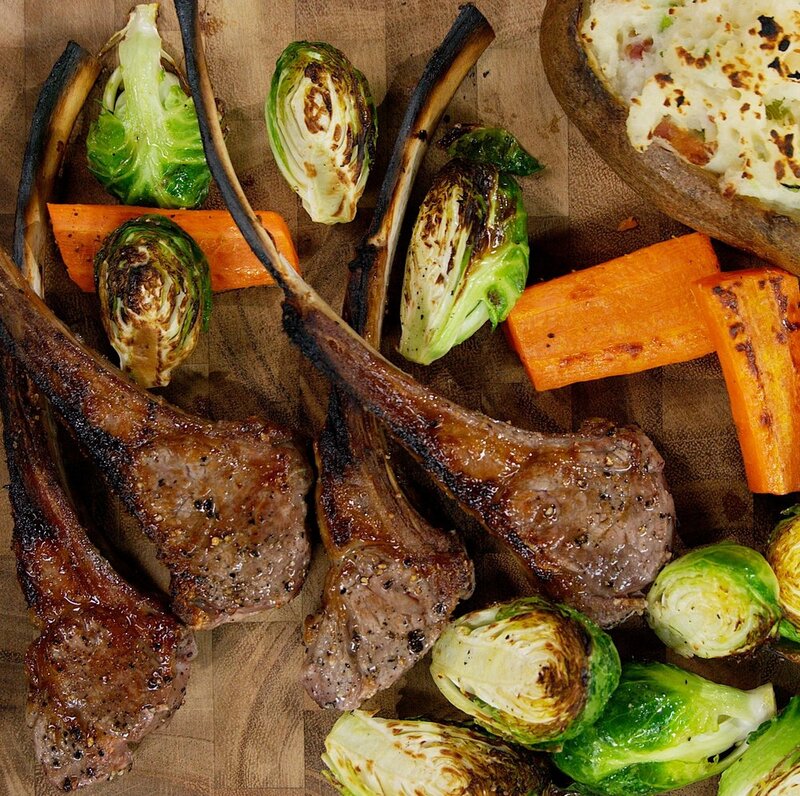 Perfectly grilled lamb chops are so easy on the Otto Wilde OFB grill! This Lamb Chop recipe goes easy on the seasoning so we can let the amazing flavour of this local small farm lamb shine through. Season the lamb with salt and pepper and allow to come up to room temperature - about an hour. Prep the veg and toss with olive oil, salt, and pepper. Pre heat the Otto Wilde O.F.B. grill to 1500°F/900°C - takes about 3 minutes or so. Dab the lamb chops to remove any moisture, this will help form a great crust. Place in the O.F.B. at Meat-O-Meter on stage 1 and sear on both sides for about 35-40 seconds. Once a nice crust forms, reduce the heat a bit and lower to Meat-o-Meter stage 5. Let them rest here until the chops have reached your desired temperature / doneness. Remove chops to a cutting board and allow to rest while you grill off the veg. Place the veg in the O.F.B. at Meat-O-Meter on stage 1 and grill for 1-2 minutes. Turn the veg if necessary, once a nice crust forms, reduce the heat a bit and lower to Meat-o-Meter stage 5. Let them rest here until the veg reaches the desired level of doneness.